This series is based on my keynote speech given at the Beat Live. Travel programs depend on travel policies for savings. See how the blue line curves down, just like we expect? Travel policies reduce the cost of a trip. Good to know, right? But as you increase the strength of that travel policy, you create costs. Costs we’ll call “traveler friction”. That’s the red curve in the chart above. Traveler friction comes in the form of lower traveler productivity. Think flying coach from Chicago to Singapore, or taking a short-haul connection for a lower fare. Push a traveler through too many of these knotholes, and she may soon find reasons to not take the next trip. That’s got to cost a company something. Tighten that travel policy too much, and you wind up with recruiting and retention problems. Those have serious costs. What’s tough about these traveler friction costs is that they are really hard to measure. It comes down to managerial judgement – that good old gut feeling. But they are real, and they move in the opposite direction of a policy’s savings. Here’s the kicker. Companies do not try to minimize the cost of their trips, nor should they. Companies do try to minimize the total cost of traveling. That’s the sum of the trip’s cost plus the cost of traveler friction. The total cost is the black curve in the chart. Companies settle on a travel policy that produces the lowest total cost, which for most is a moderate travel policy. That’s why most companies don’t mandate, and never will. Suppliers need to give up wishing for tight travel policies. They simply don’t save enough to make them worthwhile to most buyers. Buyers should loosen their travel policies if either of two things happen. One is if it gets harder to get savings from travel policies. Think smaller corporate discounts from airlines and hotels. As in exactly what’s happening right now in many markets. The other is if travelers get more frustrated by existing travel policies. Think opportunity costs, as in what’s out there, beyond the walled garden of your current travel program. Are competitors relaxing their travel policies in an effort to recruit better talent? Are app-savvy travelers finding even more and better ways to shop, book and manage their travel experiences? Do these better options make your travel program look worse by comparison? Is the basic experience of traveling getting worse – as in less predictable, less comfortable? 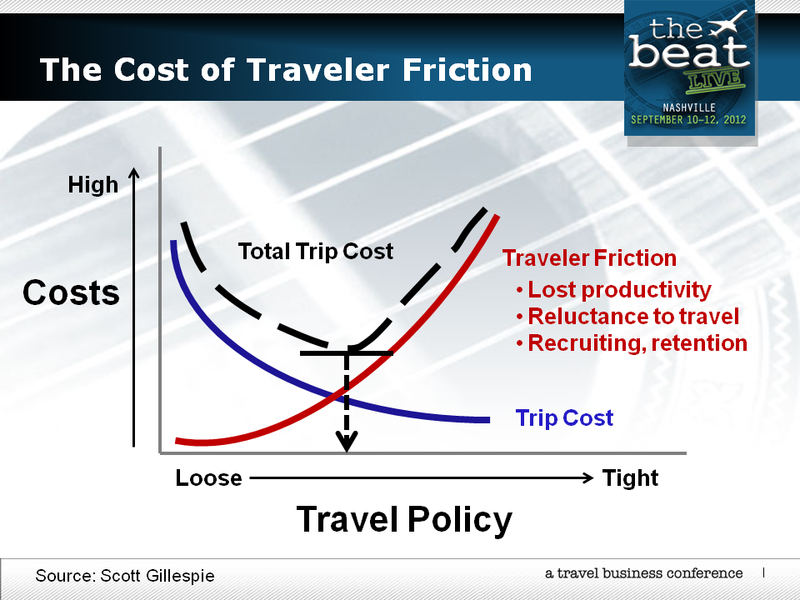 If yes, your traveler friction (the red curve) is getting steeper, whether you know it or not. 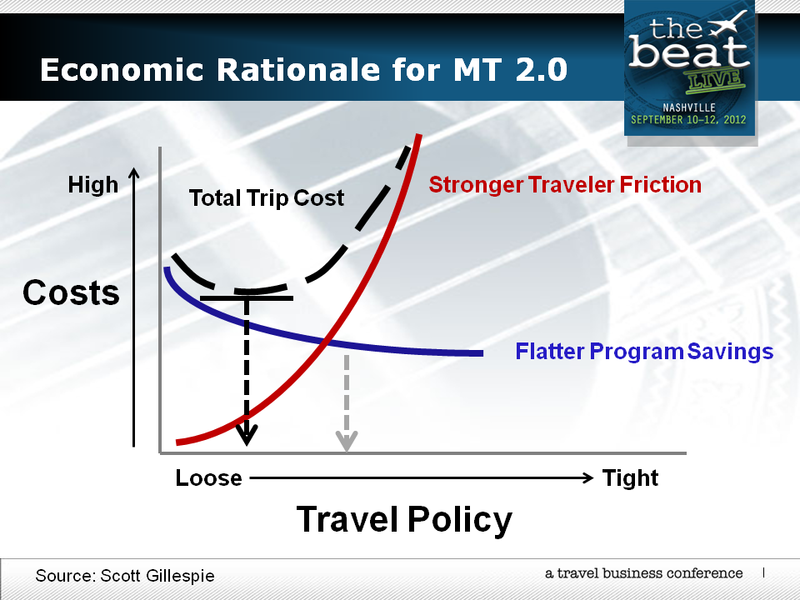 When program savings flatten out, or traveler friction goes up – guess what? The bottom of the total cost curve shifts to the left. Meaning you gotta loosen the travel policy. Or put up with higher total costs. This entry was posted in Managed Travel 2.0, Travel Policy, Travel Procurement and tagged travel policies, travel policy economics, travel program savings, traveler friction. Bookmark the permalink. First, let me publicly congratulate you for being selected to keynote The Beat Live. Have always said that if there was a Mount Rushmore of travel consultants, your face would be a given. In viewing the graphic on traveler friction, I would put forward that it is an accurate depiction of many travel programs today. I am equally troubled by the thought that a tighter policy, in and of itself, automatically drives friction. I am not troubled because I don’t believe it to be true in most of today’s programs – I struggle with it because I believe “narrative / purpose / story” has a place at the table. We can all point to very effective leaders, managers, educators, and coaches who ran a tight ship with minimal friction. Conversely, we can point to the same group of people who were effective running a loose ship. Much of the conversation in design today focuses on narrative and how the user is engaged (think recognized, not rewarded) to be part of the bigger story. Rules, in an environment where the employee doesn’t see or buy into their place in the bigger picture, will come across as punitive. The “gotcha” emails only serve to enforce that. Good leaders, managers, coaches, and educators have that ability to convey the rules in such a way that the underling buys into the program. It takes a concerted effort (the occasional email blast isn’t the answer here) but, depending on the demographic of travel spend (a key factor), may be well worth the effort. Thanks for putting this forward and hopefully it will be food for thought to get the conversations moving. If travel programs aren’t getting travelers to buy into (and seeing themselves as part of) the bigger picture, then the friction you illustrate is a natural consequence. I would still postulate that if programs want to avoid that uptick it can be done, but isn’t for the feint of heart. All good points, Tom. The tone and context behind any policy matters a lot, and some companies can manage a tight policy with less friction than other companies would create. But being a good corporate citizen can – and I’ll say will – eventually take its toll.